Star Micronics has announced two new printers featuring eight resident fonts. The two printers, the XR-1500 and XR-1000, will be shipping by the time you read this. They are nine-pin dot-matrix printers that not only have multi-font capability, but can also produce color printouts when using the optional color-printing kit. According to Brian Kennedy, director of marketing and sales, "These new printers have the ideal combination of features that users demand in output devices, including speed, multiple fonts, versatile paper handling, durability and reliability. In addition, Star Micronics has designed the XR-1500 Multi-Font and the XR-1000 Multi-Font printers to be the quietest in their price/performance categories, with noise levels of 51 and 50 decibels, respectively, when operating in the quiet mode." The XR-1500, which features a 15-inch carriage as well as Epson EX-1000 and IBM Proprinter emulation, is priced at $799. The XR-1000, with the standard ten-inch carriage and Epson EX-800 and IBM Proprinter II emulation, carries a price tag of $579. CIRCLE #122 ON READER SERVICE CARD. 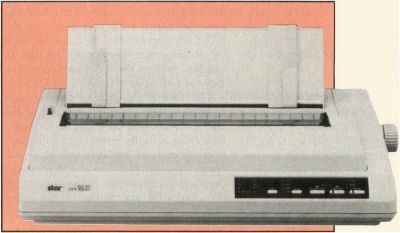 The XR-1500 Multi-Font is the first wide-carriage nine-wire dot-matrix printer with eight resident fonts. It features an easy-to-use front control panel, an optional color-printing kit and print speed at 300 cps in draft elite mode and 75 cps in NLQ mode.